I don't know about you, but as soon as the cold weather arrives, all I want to eat is warm, creamy, and cheesy comfort food. Baked macaroni and cheese immediately comes to mind. Who can resist such a decadent dish? Mac and cheese isn't exactly known for being the healthiest meal, but this recipe amps up the nutrients while trimming calories and fat from the traditional recipe. 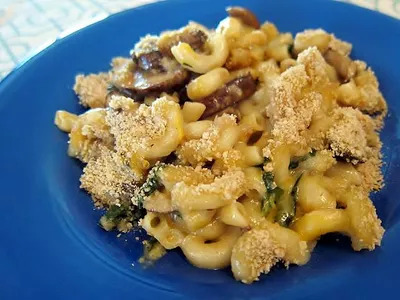 Some of the macaroni is replaced with mushrooms and chopped spinach and the cheese sauce is lightened up, but flavor is not lost thanks to the combination of garlic, Dijon mustard, and nutmeg. This recipe is so delicious, you won't even notice the missing ingredients! Cook pasta according to directions, drain water, and then transfer to a large mixing bowl. Saute mushrooms, spinach, olive oil, and garlic in a large pan until mushrooms are soft and spinach is wilted. Combine veggies with pasta. In the pot you cooked the pasta, combine cheese, milk, butter, mustard, nutmeg, salt, and pepper. Cook on medium heat and stir frequently until cheese is melted. Once cheese is melted, pour it over the veggies and pasta and mix well. Pour mixture in a small baking dish and top with breadcrumbs. Bake for 20-25 minutes until top begins to lightly brown.